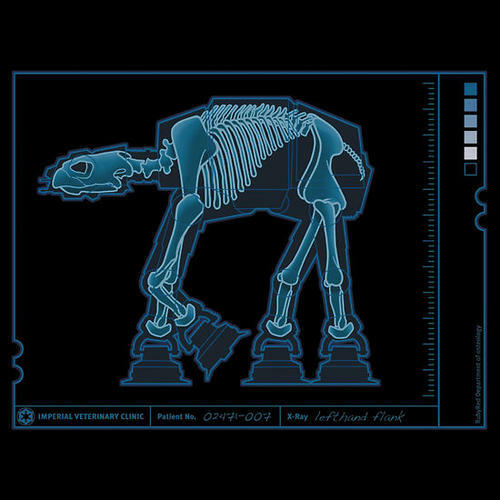 This is the AT-AT costume custom built for a 2,000-pound Clydesdale horse by prop maker Mike's Tiny Shop of Martinsville, Indiana in an attempt to set the Guinness World Record for largest equine Star Wars costume. Dare to dream. So, is the costume convincing enough to fool Ewoks? Of course, but Ewoks aren't that smart. The smartest thing Ewoks have ever done is decide to live in treehouse villages, and that's not even smart, it's more thinking like a five-year old. "But I thought you wanted to live in a treehouse village, GW." You know, I'm starting to think I've always given you more credit than you deserve. Keep going for a couple more shots and a video of the first walking test. Thanks to K Diddie and my friend Jackie, who agree they should also make a couple AT-ST ostrich costumes to complete the fleet. Shortly after this video, this horse galloped to the glue factory to end it all. Good choice. I would too if someone dressed me up in a Star Wars costume. Opening the belly and throwing in a detonator seems cruel now. You'd feel bad about it, until it started murdering all your friends and blowing up your house. this one drops a whole bunch of detonators out the back end.